Here in the engine room you will find a variety of auxiliary and ethnic percussion to keep your steel band in the groove. 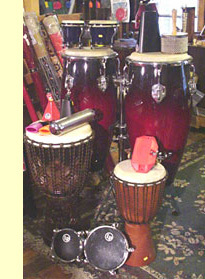 We carry complete lines of LP and Toca percussion and we import import hand percussion and djembes. Whether you are looking for entry level drumsets to back up your school steel band, or a set of timbales for a professional ensemble, we've got what you need. Here is a list of our most popular items. All Toca or LP products are available. Click on Toca or Lp to see their entire catalogues. Let us know what you would like and we will e-mail you the pricing information.